Cheese has been used as a metaphor symbolizing what one wants in life. The want may be in form of money, spiritual serenity, good job and a happy relationship. Basically, cheese is what people thinks will make them happy and when other people take it away from them they deal with the situation in different ways. This amazing parable has presented four characters that represent part of people’s lives when change comes their way. The book is a good discovery of how change works and how such change can lead to one’s success. The book commences with a get-together of high school allies in Chicago who gathered after a high school union the previous night. They contemplate on the divergent paths their lives led and they realize that they often did not want to change to situations when change emerged. 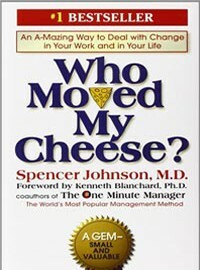 One of the parable used the time to narrate the parable of Who Moved My cheese which relates to their experience with change. The four main characters in the parable are two mice, stiff and Scurry and other two little people called Hem and Haw. They all lived in a maze and spend their time in search of cheese. However, each one of them had their distinctive approach to the hunt. The four characters would wake up every morning, put on the most comfortable shoes and run around the maze in search of the cheese. They searched day and day out until they discovered station ‘C’ which was filled with cheese. They were all very happy to have found the station. Hem and Haw were comfortable that they found the station. They viewed cheese at station ‘C’ as more than enough and they never thought that they ever need to search for more cheese. Hem and Haw walk up every morning and walked lazily to the cheese station. In perspective, Sniff and Scurry still ran eagerly to the cheese station to look for cheese. A day came when Hem and Haw walked lazily as usual to Station ‘C’ only to find no cheese. The two characters were very angered by what they saw. They were unprepared as they perceived the cheese supply to be constant. They complained how unfair the situation was and got very angry with whoever stole their cheese. They were very disappointed and they were forced to return home hungry. Comparatively, when Sniff and Scurry found Station ‘C’ empty they were not surprised. They had already realized that the cheese was decreasing and were already prepared for the change. They easily accepted the new situation and moved on in endeavors to look for more cheese. The next day, Hem and Haw walked to the cheese station with expectations that they would find cheese. They never thought things would change but they were wrong as the supply of cheese was gone forever. Haw realized the situation and proposed to Hem that they search for new cheese. However, Hem already had a closed mindset and rejected the new idea. In the meantime, sniff and scurry had already discovered a new cheese station ‘N’. For many days, Haw and Hem lacked cheese and kept on blaming each other. Haw kept on suggesting that they have a new start and look for cheese but Hem kept on rejecting the proposals. Hem was not ready for any change, he was afraid of venturing into the unknown. Owing to their denial of change, the two people remained without cheese for many days. One day, Haw realized that he had to overcome his weakening fears. He laughed at the situation and he simply made up his mind to move on. He entered the maze and had begun his new journey in search of new cheese. While he walked down the maze, he would stop to write on the walls on the experiences he was going through in search of change. He wrote this with an intension of giving guidance to his friend Hem incase he someday accepted the situation and searched for new cheese. In His journey, Haw realized that when one moves beyond fear, they have more freedom. A day dawned and Haw finally found the new cheese station ‘N’. He realized that cheese at the new station was even sweeter than cheese at station ‘C’. In order to remember all that he had learnt in his search for change, he wrote to the walls of cheese station N six principle lessons on change. Haw realized that change will always happen but key thing to enjoying change is being ready for it and moving with the change.